Imagine this scenario: you're finally moving into your dream home. It's beautiful - lots of natural light, open floor plan, beautiful finishes, high quality wood flooring - and it's all yours! As you're moving your furniture in, however, you notice something: long lines of scuffs from a piece of furniture that scraped against that perfect flooring and took it down a few pegs. Oof, right? This nightmare scenario is avoidable, however. All you have to do is take heed of the tips we’ve listed below for keeping your floors scuff-free during a move. Lay doormats out inside of each doorway. The biggest opportunity for a misstep, trip, or drop comes right inside door frames. Fallen leaves, muddy floors, wayward sneakers, and boxes all find their homes near doorways, especially during a move. Keep a series of doormats right inside any entrance to your home to allow for an easy transition from outside, in. This simple step will seriously reduce your risk of dropping furniture and causing scuffs. Use old rugs to help you protect new floors. Before you move, hold on to dirty or old rugs that you plan on getting rid of. Wait to get rid of them until after you move. In the meantime, use them to line the pathways inside your new home where you’ll be moving your heavy furniture. Invest in some furniture sliders. You probably won't be able to lay rugs or runners down on every inch of hardwood in your new home, unfortunately. For the times when you need to set the furniture you're moving down but it isn't yet in it's final resting place, we recommend furniture sliders. These felt-lined circles or squares rest beneath the points where furniture meets floor as a buffer to prevent scratching. The best part? They're pretty affordable. If you don't want to use furniture sliders, just think creatively. Furniture sliders are ideal because they're at a good place between usefulness and affordability, but they're not the only thing you can use. If you'd rather not purchase anything, try wrapping some cardboard in a blanket or towel and using that as a makeshift slider. Between these solutions and protective mats, rugs, and runners - you should be good to go. However you move, whenever you move, Storage Direct always has your back. 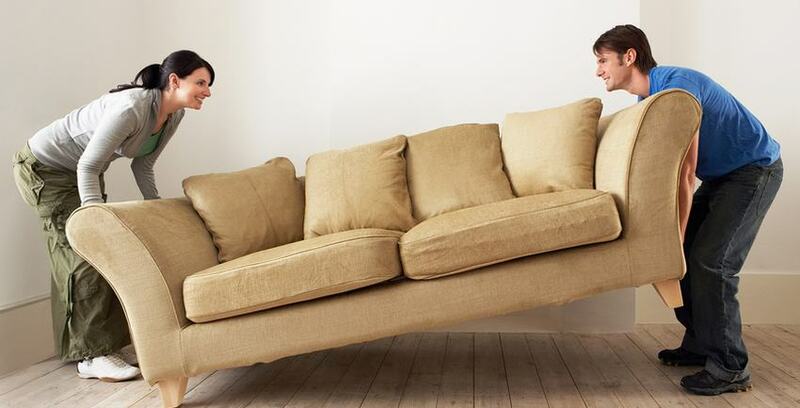 If you don’t want to risk any scuffs at all, consider placing some heavier furniture in temporary storage while you figure placement out. We always have room.